Have you heard of Dana Atchley? Before his death in 2000, Atchley was a bit of a legend and certainly a pioneer in the digital-storytelling front. His clients included Coke, EDS, Adobe, Silicon Graphics and many others. He even worked with Apple as a charter member of the AppleMasters program. 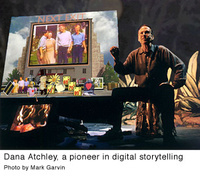 In the '90s, Atchley was helping senior executives create emotional, compelling talks that used the latest technology to create "digital stories" that connected and appealed to audiences in a more visceral, visual, emotional...and real way. Dana Atchley's ideas about technology and storytelling were beginning to shake things up in the '90s. If Atchley would not have sadly passed at the young age of 59 back in 2000, presentations — even in the world of business — would be far more appropriate, engaging, and effective today. "...digital storytelling combines the best of two worlds: the 'new world' of digitized video, photography and art, and the "old world" of telling stories. This means the "old world" of PowerPoint slides filled with bullet point statements will be replaced by a "new world" of examples via stories, accompanied by evocative images and sounds." Take a look at what FastCompany was saying about Dana Atchley in 1999 in the article What's Your Story? "Tired of delivering the same old business presentations in the same old way? Then join the Digital Storytelling movement, and take a lesson from its founder, Dana Winslow Atchley III. You may never use slides again." "So why does communication about business remain so tedious? Most businesspeople describe their dreams and strategies — their stories — just as they've been doing it for decades: stiffly, from behind a podium, and maybe with a few slides. Call it Corporate Sominex." "Digital storytelling is more than a technique. In fact, it's become something of a movement among both artists and businesspeople." These bits from the FastCompany article sound so promising, don't they? I get excited reading this, thinking about the possibilities. Yet, since 1999, how much has really changed? Nearly seven years have passed. Some people are indeed using the digital technology in presentations the way Atchley envisioned. But there is such a long, long way to go before we rid the business world of the "corporate Sominex" phenomenon. This year the Digital Storytelling Festival, founded by Dana Atchley and his wife, Denise, in 1995, continues in beautiful San Francisco. There is a lot to learn there. I hope the festival is, once again, the start of something big. I'm enjoying "Presentation Zen" very much and wanted to learn more about Atchley. The book mentions www.nextexit.com, but it does not seem to be available any longer. Do you happen to know if the site migrated to another URL? Thank you and thank you for your insight and inspiration to do my job a bit better than I did the day before. Just found a video by Dana, titled, "Spots Before Your Eyes". Look for it on Youtube.